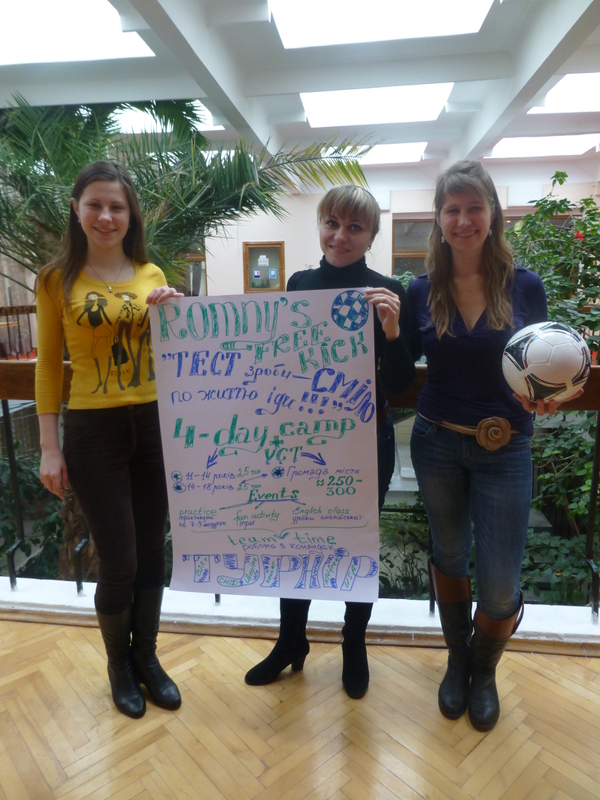 At the last minute, I was accepted to attend a new training program in Peace Corps Ukraine called Free Kick. The program is a Ukrainian branch of the globally active organization, Grassroots Soccer. This organization works with the mission of using the power of soccer to educate, inspire, and mobilize communities to stop the spread of HIV with the aim of creating an AIDS free generation. This is the first year Grossroots Soccer has partnered with Peace Corps Ukraine to form ‘Free Kick’ but they have been active in many other Peace Corps communities around the world since 2002. I was thrilled when I was invited to participate not only because I could be among the first to be involved in such a great Ukrainian program, but also because I was allowed to bring my counterpart and one student to the week of training. My counterpart has been to many trainings hosted by Peace Corps but this was the first time I had the opportunity to share my world with a student. I picked one of the sweetest, smartest and most popular girls in my 10th form. It was a great choice and I can’t wait to continue working with her throughout the year. Lesia, Me & Anya graduating from the program with Jameson the Grassroots Soccer representative and Oleksiy the Free Kick director. Over the course of our five day training, we all participated and graduated from the Free Kick ‘Skillz Curriculum’. This consisted of 9 one-hour practices that used the symbolism of various soccer techniques to talk about the biology, transmission, treatment and lifestyle of HIV/AIDS. It was the perfect blend of active learning, serious discussion and fun. In addition we were taught how to share the curriculum with our communities by hosting camps where students ages 12-18 can learn about HIV. Each camp is also coupled with a testing event which offers free HIV testing to the community during which camp participants can work together to mobilize their community to get tested in an effort to bring awareness to the cause of creating an AIDS free generation. Our plan for Romny’s Free Kick camp and testing event. At the end of our training week, all 25 of the participating groups of volunteers/counterparts/students brainstormed, designed and presented their plans to host a Free Kick camp and testing event in their communities. Lesia, Anya and I have planned ours for the end of August, right before school starts for the year. We are so excited and passionate about our ideas now but I fear that these feeling might dwindle once we return to the everyday routine of life. We will see how thing play out over the next 5 months.